According to Austin Smith, director of the Stem Cell Institute at the University of Cambridge and also known to his students as the stem cell guy, organoids are “probably the most significant development in the stem-cell field in the last five or six years”. So what exactly are these futuristic sounding things? In essence, organoids are miniature versions of whole organs that can be grown in vitro, that is, in the lab/outside an organism. Growing these organoids works relatively well and easily for some organ types such as the gut/colon, the liver and the stomach. The main distinguishing feature between an organoid and a real organ is size – organoids rarely grow beyond half a millimetre in diameter. Partly this is because a vascular system, supplying oxygen and nutrients, would need to be integrated to allow larger organoids to grow. However, their three-dimensional organisation and functionality can be surprisingly similar to that of their real counterparts. OK, great. But where do organoids come from? Although Aristotle proposed that living things could arise from inanimate matter (the theory of spontaneous generation) this way of thinking is generally accepted to have been disproven by Louis Pasteur and others in the nineteenth century. Since organoids do not just pop into existence in scientists’ Petri dishes, one has to grow them from something. Several different starting materials can be used: most easily or intuitively, organoids can be derived from tissue biopsies of the corresponding organ. Alternatively, one can extract adult stem cells from a (mouse) organ and let those cells grow in vitro using special cell/tissue culture conditions. Lastly, it is possible to “persuade” embryonic stem cells or induced pluripotent stem cells to become organoids, provided that one can supply the right signals in the growth medium. Organoids – so what are they good for? One of the earlier studies (Sato et al., 2009) showed that it is possible to generate intestinal organoids from single intestinal stem cells, in effect backing up the researchers’ claim that there is a well-defined (so-called Lgr5+) stem cell in the gut. Firstly, therefore, organoids help answer questions in the fields of developmental and stem cell biology. 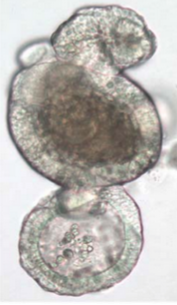 A sample “mini-gut” of Sato et al. is shown below: it exhibits crypt-like structures (where stem cells reside and replenish the tissue), villus-like structures and finally, the spheres partly fold in upon themselves to mimic the lumen or interior of the intestine where food would be digested. For the intestine, but also other organs such as the brain, stomach and pancreas, organoids can shed light on questions of basic anatomy: organs are highly complex and often difficult to study in vivo/inside an organism and for some organs we still lack surprising amounts of knowledge. For example, McCracken et al. (2014) used human pluripotent stem cells to grow an organoid that resembles the first half (antrum) of the stomach. Next it will be interesting to find out how to create the second half (fundus), and this, in turn, will help explain how a whole stomach and, eventually, gastrointestinal tract develops. However, organoids are also being used to study diseases such as cancer, diabetes and neurological disorders. For example, Boj et al. 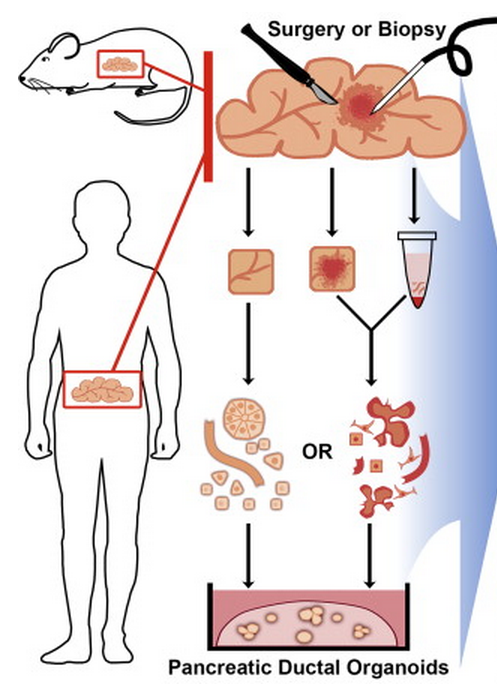 (2015) took biopsies from both mouse and human pancreases (or pancreata, if you are feeling particularly confident) and could obtain corresponding pancreatic organoids. In particular, these organoids recapitulated several different stages of pancreatic cancer and could be genetically modified as well as used to discover new ways in which cancer cells are abnormal. In particular, the hope is that, if making organoids becomes fast, cheap and easy, it can be integrated into medical procedures. Van de Wetering et al. (2015) have attempted this for colorectal cancer. In their paper they describe the creation of a “living biobank” of cancerous intestinal organoids from twenty cancer patients. Since the organoids come from a specific patient’s body it can be used for in-depth analysis of mutations, but also for drug testing to see which of the available drugs might work best for the patient in question. This approach is known as personalised medicine and despite being talked about a lot by scientists and the media alike, has yet to really take hold in hospitals. This crucial last step – from “bench-to-bedside” – really seems to be the major obstacle stopping cool discoveries in the lab from becoming useful in hospitals/treatment settings. Training more medical doctor/PhDs (MD/PhDs), which is far more common in the US than in the UK, would certainly help. These people are able to appreciate the problems (or challenges, if you like) as well as the needs on both sides. But even then, growing organoids for each and every cancer patient would be a huge logistical undertaking, so there would have to be a lot of investment as well. Maybe initiatives such as these “organs-on-chips” – testing drugs on organoids in an organised, high-throughput manner – will bridge the gap? This entry was posted in Factual, Opinion and tagged Cancer, gut, organoids, pancreas, stem cells, stomach by Victoria Wang. Bookmark the permalink.